As previously mentioned, this movie is pure bottled fun. (Not that you should take my word for it.) 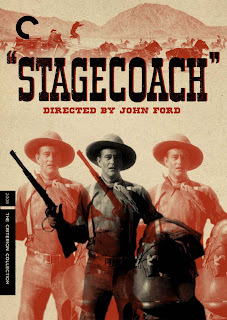 But like a lot of old Westerns, it never got the design it deserved. 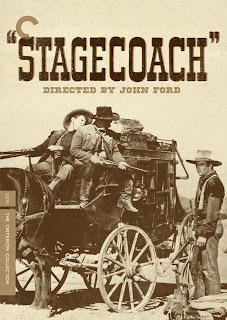 Especially when they get to DVD, so many classic Westerns just get the "big John Wayne in a cowboy hat headshot" treatment, to the point where I don't know how you'd tell Stagecoach from The Searchers. So I really wanted to try to find a new angle on film westerns, something other than the aged sepia-toned thing that you see so often. I liked the "western noir" approach I worked out for The Furies, but that wasn't appropriate for a film this light... and besides, I'd already done that! Unfortunately, there wasn't a whole lot to work with, in terms of photography. In fact, I didn't even have much in the way of big John Wayne headshots! (Mainly because John Wayne wasn't even the marquee name for this film at the time of its release--Claire Trevor got top billing.) I tried a few photo based treatments that were pretty bad--most of them bad enough that I never even hit "save" on the files, so I can't show them here. The least egregious of the bunch is below. 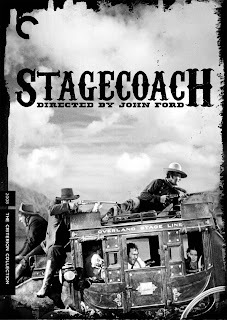 The execution is still pretty rough, the tattered black border in particular, but I did like this photo of the whole cast in and around the stagecoach--it is really an ensemble picture, so that did seem to capture something of the film. 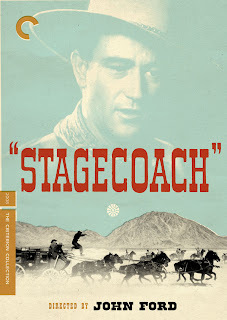 Then there was this version, which uses the original title treatment from the film. notice how quickly I fell back into bad sepia-toning! The rest of it, meh... but the title treatment, at least, was a good idea. Better, but too Warhol for no reason. (Plus, the saddle doesn't look nearly as good repeated as the guitar.) I wasn't looking to enshrine the film as a kitsch artifact, I wanted to emphasize the upbeat fun in a way that was appropriate to the period but also felt modern and cool. 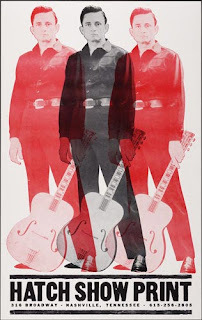 Then I remembered some great prints that Josh Cochran (who you may remember from Wise Blood) showed me, which evoked old tin toy packaging, screen printing, and just plain looked great. And how about those colors! ...but it just immediately brought it back to discount twelve-John-Wayne-movies-for-ten-dollars territory. Better to let the concept stand... and luckily everyone agreed! It took a few lousy covers to get there, but at the end of the day, this is one of my favorite covers in a long while. I hope you all like it, too! This is my favorite blog. Thank you for the great insight into your beautiful work. 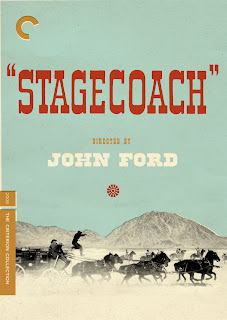 I was so excited when this title was announced by Criterion, and then when I saw your cover I was even happier. Beautiful. Thanks for taking us through the process, I really enjoy these posts. Truly fantastic! As classy and exciting as the film itself. I'm really looking forward for this one. Perfection. Glad they didn't make you keep that Wayne image in the background! The artistic process is fascinating, but I'm not sure why Criterion insists upon employing such talented people to create such lousy covers. Again, instead of using classic poster art, we get another cartoony pop art cover that does nothing to sell the film. Incredible cover! As a screenprinter I totally love the aesthetic you chose for the design, and I have to say (though my old professors would kill me for saying this) my favorite part is the "off-register printing" of the color background with the criterion logo and spine label! Great cover, Eric. I actually just watched this last night, and this Nashvillian was happy to see the Cash/Hatch image on the reverse wrap. Nice touch! Love the cover. While adding the film to our Netflix list my boyfriend and I fell in love with the cover. Found your blog while searching for a poster version of it - any chance there is one? Would love to have it on our wall beside some other favorites. I love this cover, and I'm so excited to have stumbled on the "making of" story of its creation. Like Megan, I was googling for a poster copy and would LOVE one. Is there any way one could be produced?